Founded in Switzerland in 1948 by Dr. Helene Dünner, this dynamic, independent, family- owned company is guided by a passion for the beneficial, restorative and health-fortifying properties of plants and herbs. Organic herbs, grown for centuries in alpine meadows in the heart of Switzerland, are cultivated and hand harvested with great care by trusted and personally known local farmers. 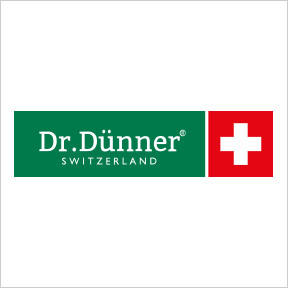 Created by scientists, Dr. Dünner’s unique and balanced blends utilize the latest research, as well as ancient and traditional European knowledge of herbal medicine. The sustainably sourced herbs and plants are blended in small batches to preserve the potency of the precious compounds contained within. Inspired by nature and dedicated to the highest standards, Dr. Dünner creates high quality, safe and effective natural ingredient products. All essential stages of production take place in Switzerland, assuring a short distance from soil to syrup. At Dr. Dünner®, the traditional knowledge of picking, drying and storage goes hand in hand with state-of-the-art technology and laboratory techniques. While continuing on their quest to become a zero-emission company, their facility is powered by 100% renewable resources, and all packaging is FSC-certified, ensuring that products come from responsibly managed forests that provide environmental, social and economic benefits. Their Non-GMO products are gluten and lactose free with low carbon footprint. Linden Blossom: This liquid immune-supportive formulation provides a proprietary blend of synergistic ingredients, including powdered acerola and freshly harvested linden flower, lemon mint, lemon thyme, and elderflower extracts. Flavored with pure Swiss Baselbiet cherries from their own orchards. Gluten, and lactose free, Non-GMO vegan formulation. Sambu®: This concentrated proprietary liquid formula provides the beneficial properties of wild grown elderflower and elderberry in support of the maintenance of a normal immune response. Gluten, lactose and preservative free, Non-GMO formulation. Nasturtium Capsules: Rich in natural phytonutrients, bioflavonoids and vitamin C, this organic herbal blend helps to reinforce normal daily immune function. Ingredients include rosehip, European elderflower, garden nasturtium and vitamin C, powerful allies during summer cold and winter flu season. Gluten and lactose free, Non-GMO vegan formulation. Sambu® Guard: This liquid supplement provides three key ingredients for natural immune support, especially helpful during cold and flu season. The proprietary blend includes wild grown elder fruit concentrate, wild grown elder flower extract, and echinacea whole plant concentrate, as well as vitamin C from acerola fruit powder. Gluten and lactose free, Non-GMO formulation. Sambu®Guard for Kids: It’s not easy for parents to keep kids healthy, as they get exposed to germs daily while their immunity is still forming. This tested formula utilizes the natural immune promoting compounds of elderberry and echinacea to help prevent or reduce the effects of colds and flu. Flavored with natural raspberry fruit powder. Gluten and lactose free, Non-GMO formulation. This entry was posted in Home and tagged Dr. Dünner, Dr. Dünner® - Featured Brand, Linden Blossom, Nasturtium Capsules, Professional Supplement Center, Sambu, Sambu Guard, Sambu Guard for Kids, Vitamins and supplements, www.professionalsupplementcenter.com. Bookmark the permalink.